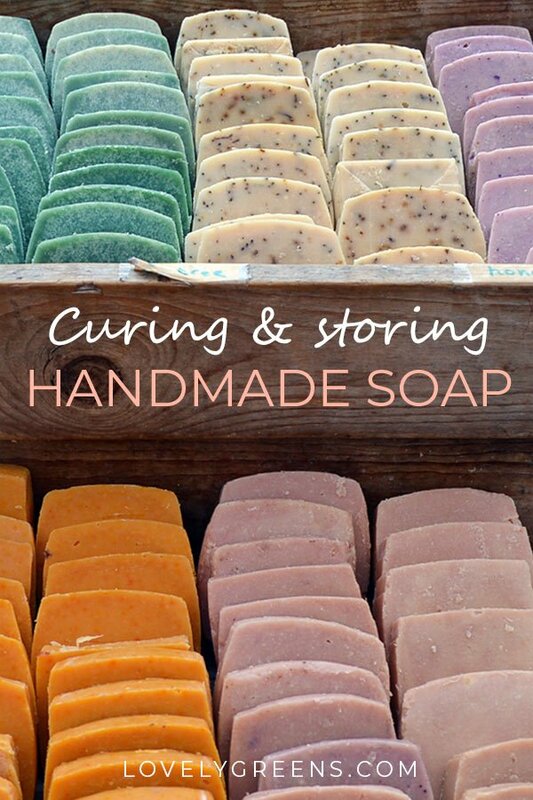 Tips on how to cure handmade soap and ideas for storing it. 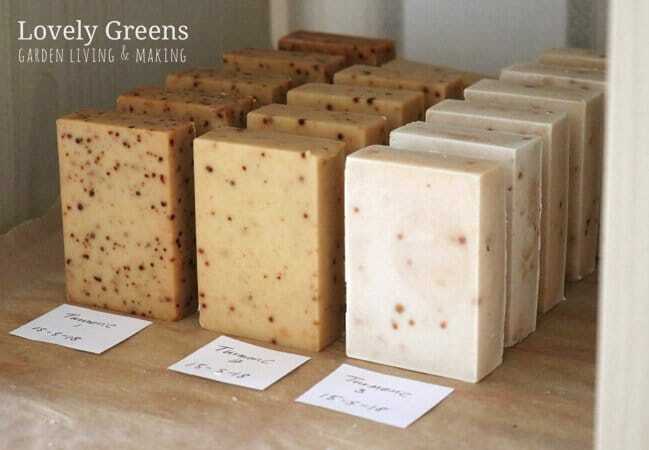 Curing is the process of allowing saponification to complete and for the soap to fully dry. It takes about a month. 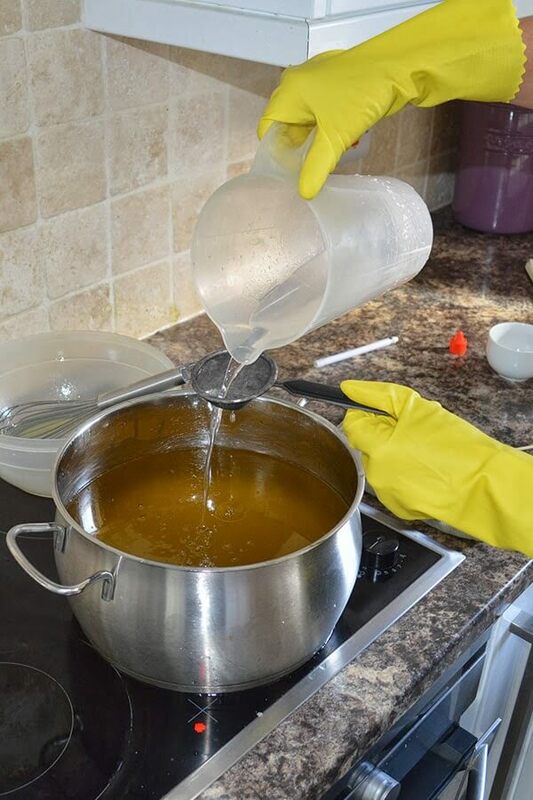 When making handmade soap you need to allow it to cure before using it. Contrary to what other sources may say, this applies to whether you’re using the cold-process or hot-process method. That’s because it’s just as much about letting the bars dry as it is about saponification. 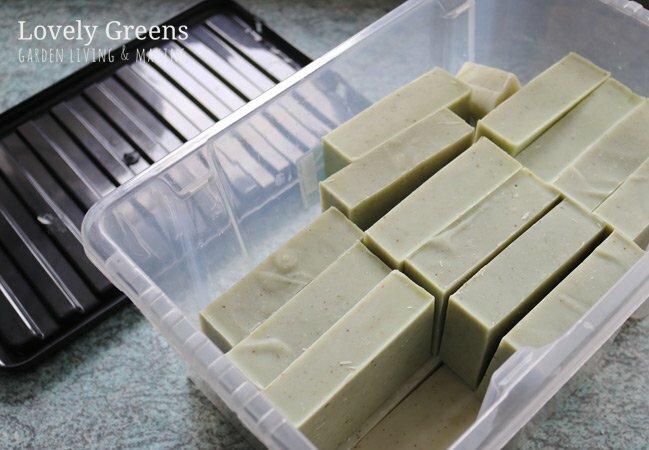 This piece goes through what’s involved in the curing process, why it’s needed, tips on how to cure your soap faster, and finally how to store your soap when it’s fully cured. 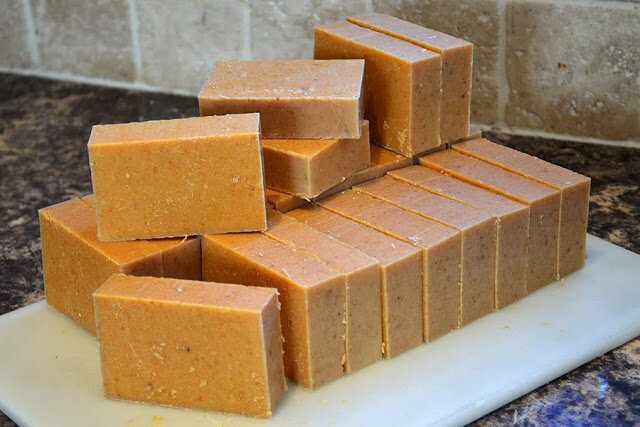 If you’re new to soap making, you can learn how to make handmade soap starting on this page. Curing three batches of Turmeric Soap. The speckles come from the spice. 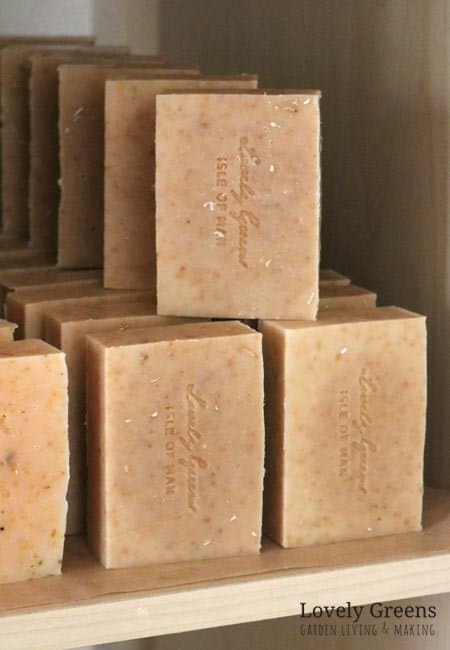 Why the need to cure handmade soap? Even though it looks good to go there are two main reasons why you need to cure freshly made soap. First of all, it’s to allow saponification to complete. Secondly, it’s to let the water content evaporate out and the bars to dry. Saponification is the process where the oils in your recipe are broken apart by and bonded with the lye. This process is mainly complete in the first 48 hours after you make cold-process soap but the remaining 5% of lye needs more time. In hot process soap saponification is finished by the time you mould up the soap but it’s for the next reason that it too needs to be cured. When making soap you use water to dissolve the powdered Sodium hydroxide (lye) into. There’s quite a lot of water in beginner soap recipes since it helps to slow Trace down. This gives you more time to work with your soap before it begins hardening up. That water is still in your bars when you take them out of the mould. If you don’t allow them to cure and dry then your bars will not last once you start using them. They’ll turn to mush in the bath or shower. Even in more advanced soap making when you use less water, you still need to give the soap time to dry. More about that below in the section on ways to speed up the cure time. I go through explaining this process a lot in my cold-process soap making lessons. That’s one reason that I’m writing this piece — it’s so that I can send the link to my students after a lesson. I hope it can help you too! If you’ve made cold-process soap, I think it’s best to leave it in the mould for 48 hours. This means that by the time you take it out, the vast majority of the lye has (probably) bonded with the oils. After two days it’s safer to handle and will be harder than it was the day before. I’d advise wearing gloves for handling your bars at the point of unmoulding. It’s unlikely that you’ll feel anything uncomforatable but there could still be lye in the bars. Touching fresh soap that’s lye-heavy can cause skin dryness and irritation, especially if you have sensitive skin. If you’ve used a loaf mould, slice your bars up. This will increase the surface area for drying and cutting fully cured loaves can be more difficult. The size you cut them is up to your personal preference. The soap I sell is about 1″ thick. Once your bars are un-moulded and sliced it’s time to cure them. There are many places that you can cure your soap but the premise is all the same. It needs an airy place out of direct sunlight. You can use a book shelf, metal racks, cardboard boxes, stacked milk crates, or even make towers of soap. Stacking soap during curing is perfectly fine and if you live in a warm and arid place, you could even cure your soap outside. That’s how it’s been traditionally cured in the Mediterranean and middle east. I’ll pop a video below for you to see how they do it. Your soap won’t be sopping wet but there will be moisture and it can react with surfaces. 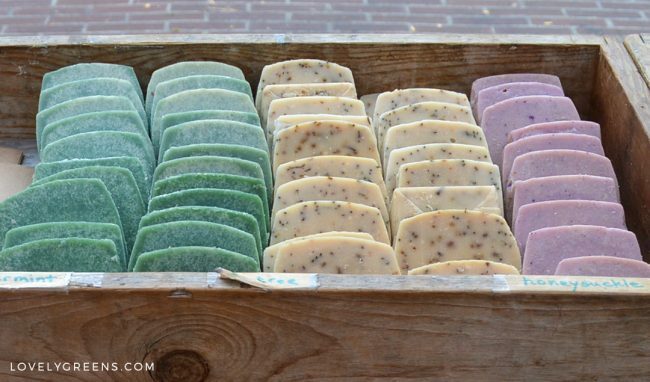 Line them with greaseproof or baking paper to protect both your soap and the units you’re using to cure it on/in. Then space your bars out so that there is plenty of air flow around them. Again, feel free to stack them, as long as there’s plenty of air that can circulate. Even if you’ve only made one batch of soap, it pays to label it. Mark the date you set them on the shelf and also which soap it is. It could be a batch number or simply the recipe name. If you have different batches, feel free to place them side by side but keep them from touching. If you’ve used different scents, they can affect each other during that long cure time. Sometimes also if they’re not touching, so keep that in mind. Also, the cure time begins not from the day you made the soap, but from the time you set it on the shelf. Curing soap on a metal rack lined with baking paper. Interested in the Cochineal soap recipe? The time you leave your soap to cure is dependent on the oils and water content of your recipe. A standard four weeks is a good enough time for the majority of cold-process soap recipes. If you’re making a Castile soap or one that’s primarily olive oil then you should wait six weeks. It takes olive oil longer to saponify and also to harden up. For hot process soap, some of the water in the recipe will evaporate off in the cooking process. Not all though. That’s why hot process soap needs to be cured for 1-3 weeks. Err on the longer side if your bars contain a lot of olive oil. What happens if I don’t let my soap cure? There are a few things that can go wrong if you don’t allow your soap to cure. First of all, it could still contain lye. Even though (cold-process) saponification is mainly complete in the first 48 hours, there’s still a chance that your bars will contain lye for up to a month. Lye heavy soap can cause skin irritation and I imagine that there’s a potential for damage if it gets in your eyes. Curing lets the water content of the soap evaporate out leaving you with hard bars. Soft uncured soap will disintegrate quickly if you get it wet. What a mess and a disappointment it would be to see your handmade creation lying in a puddle of its own mush. If you decide to package up uncured soap it could spell disaster too. The moisture can destroy your labels, create condensation under plastic, and otherwise ruin your product. There are a few ways that you can shorten the cure time of soap. 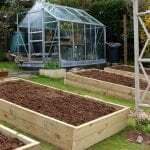 The first is to use the water discounting method, which means to use lye solutions with less water. 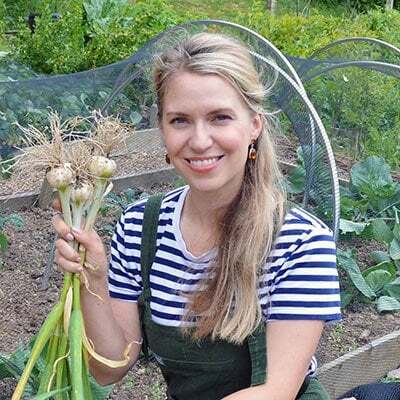 In a standard recipe you use a 33% lye concentration. For example, if your recipe calls for 333g of lye then you’d make your lye solution with 333g of lye to 667g of water (333g is 33% of 1000g). Bringing your lye solution to a 40% concentration can shorten your cure time to just two weeks. The absolute minimum amount of water you can use is equal to the amount of lye in your recipe — this is only advised for advanced soap makers. Creating stronger lye concentrations speeds up how quickly your soap comes to Trace and hardens. If you don’t work quickly, it can sometimes become unworkable. It can also affect how evenly your soap gels. Another way to cure handmade soap faster is to use a dehumidifier. I keep one going in my work room when soaps are curing. The time it takes the soap to cure will vary but if you weight a bar regularly and notice that it’s not losing weight then it’s probably ready. 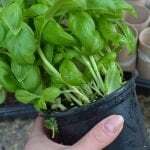 You can also cure your soaps outdoors if it’s warm and very dry. Make sure to keep them out of the sun and that they have really good air flow. An electric fan blowing on soap could also reduce your cure time. Again make sure to weight your soap at the beginning of the cure time and keep an eye on the weight regularly. If you’re going to use this method it really helps to know the weight of a fully cured bar of soap. If you’re using the same batch and size as a previous batch weight one of those bars. 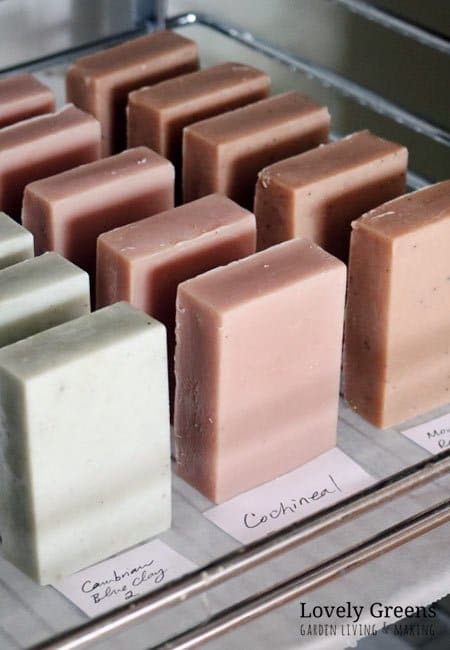 Once your soap has fully cured, you’re able to use, gift, or even sell your bars (providing you have your business, insurance, and beauty documentation set up of course). You can also wrap them in paper packaging. Wrapping them in plastic is a bad idea though for two reasons. First of all, single-use plastic isn’t good for the planet or for the image you want to project with your handmade soap. There will be customers who won’t want to buy it if there’s anything plastic about it. Secondly, if there’s even the tiniest amount of moisture still in the bars it won’t be able to escape. That means that excess moisture could cause your bars to get Dreaded Orange Spot, literally orange spots on the bars. The spots can get icky and have an unpleasant odor. The best place to store handmade soap is in the open air. One idea is storing them in a wooden box that also serves as a farmers market display. Simply leaving them on the curing rack until they’re needed is also common. If you’re worried about the natural scent fading, you can also store your soap in a sealed container. However, there are a few things you need to do if you head down this route. The bars should be cured in the open for 6-8 weeks and be bone dry before you put them in. Next, put a couple of those silica gel packets in the container to absorb any moisture. After sealing it, make sure that you open the lid every week or so to air it out. I tend to keep a batch of soap in a plastic bin and then take bars out as I need them, which is pretty regularly. Just know that keeping them stored like this can become an issue if any moisture makes its way into the box. This can be easily calculated by looking at all the labels of all the ingredients you used to make soap. The closest best-by date is the best-by date of your new batch of soap. Making soap doesn’t prolong the life of oil about to go off. Using old oil can also cause the Dreaded Orange Spot mentioned before. Some fresh oils have a shelf-life of up to two years though — coconut oil for example. Pure olive oil has a shorter shelf-life and will go rancid a lot quicker. 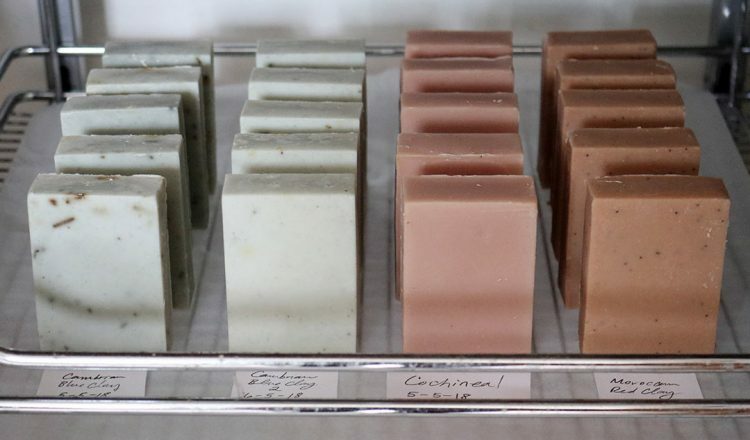 Rancid oil in soap has an odd scent and it’s not one you want to rub all over your body. It pays to invest in fresh ingredients when you make handmade soap. For even more soap making ideas, recipes, and tips head over here.